Maxine Waters is now chairperson of the Financial Services Committee. 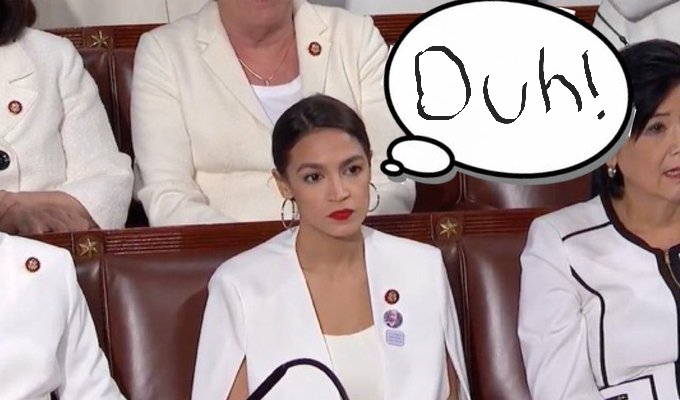 She has appointed AOC to the committee. In what universe does this make any sense. Elections have consequences. She wears white, looks good while doing so, thinks the world will end in 12 years and promulgates socialist ideas that will end it much sooner. She has a very bright future in the Democrat Party. I'm pretty sure if you could figure out how to rig a dynamo to upward failure, you'd solve the energy crisis forever. The Sarah Palin of the Left. But remember...this is a world where Barack Obama has a Nobel Prize. Gotta find the happy ground between ignoring the silly woman and laughing at her. Careful. I got pushback when I said AOC was the Left’s Sarah Palin. Some folks here think far too highly of SP to let that go. But yeah. It’s a good point. In a world which would award a peace prize to a man before he took office, before he could show the world how he would wield the power of the POTUSy, just because of the hope of the grand things they thought he would do, gives us a glimpse of how the elite left think of themselves. Turns out, he droned the **** out of people. And maybe some or most of them deserved to be droned. But that’s not the utopian heaven on earth the elites thought black jesus would deliver. Some of the elites seem to act like they think AOC is the next savior. Maybe it’s a good omen that there’s no sign of a peace prize in the works. And it helps that America got to see AOC along with the rest of her intersectional feminist harem behaving like a narcissistic ****s during SOTU. Last edited by jamil; 02-07-2019 at 07:36.